On November 17, 2012 at approximately 0840 a.m. I had been sitting in my blind since 0630 am in Bainbridge NY. At 0840 am I heard a loud crashing off to my left approximately 50 yards away all I saw was a tail. Shortly there after three does appeared a little bit closer coming toward my hunting blind from the left. Behind the does was this 9-point buck slowly maneuvering through the woods in behind some trees. The does came to about 15 yards away off to the left and barely moved for a period of 5 to 6 minutes as I had my 270 weatherby out the left window waiting for the right shot to take this 9-point down. The buck then proceeded to come across the front of my blind so close I couldn't even see him as it is off the ground about 4 feet. I waited until he slowly made his way past the blind and about 15 yards out facing away behind some brush to move my gun to the front window. The buck then come out around the brush pile onto a four wheeler trail approximately 20 yards out and was broad side. I shot once and he flinched and stayed completely still. So, I took another shot and he took off to my right and was about 50 yards when I took a third shot taking the big 9-point buck down. This same buck I caught twice on my game camera. This is the biggest buck I have ever shot and one of the most exciting days of my life and will never forget it. 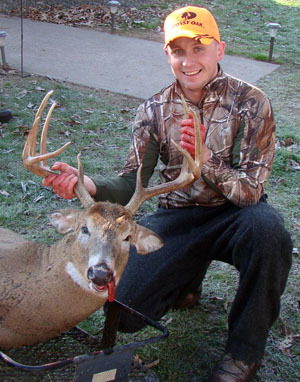 Nathan's buck has an 18" spread and a green score of approximately 149. It was taken in Chenango County NY, town of Bainbridge on 11/17/12.